I play a lot of video games. Naturally, this is bound to happen if one of your main hobbies is writing about video games. Sometimes the experience is brilliant, engaging the player with great mechanical qualities, such as the fluid movements and controls in Bayonetta or The Forgotten Sands. Or maybe what grabs the player is a compelling story or beautiful graphical elements, such as Assassin’s Creed or Dragon Age. But sometimes I find games that are captivating based merely on their simplicity. I can sit for hours and play mildly strategic puzzle games like Luxor, Hexic or Jewel Quest because doing so creates a sort of mindless zen-like atmosphere where my hands do more work than my brain-the perfect way to end a stressful day at work. These games are more instinctual, reactionary and, tragically, usually come shipped with repetitive, uninspired background music that you can’t help but tune out after a few minutes. When diving into another ball shooting session in Zuma or a gem switching marathon in Bejeweled, my first ritualistic step after turning on the game is to switch on the music in our personal library via a media server and listen to such lovelies as Air, Conjure One, Oceanlab and We Have Band to add a multilayer of enjoyment on top of a single dimensional experience. I am blissful, I am euphoric, I am combining elements to achieve personal satisfaction. But now I have Chime. 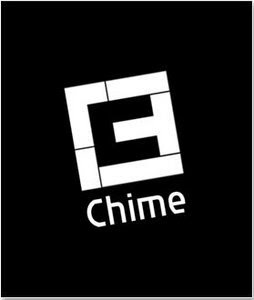 Chime was released on XBLA at the beginning of last year by Zoe Mode with the help of OneBigGame, who aids in the development of games for charitable organizations. Until last November, when you purchased Chime a portion of the money went to the Save the Children and the Starlight Children’s Foundation. If you didn’t know this prior to playing (and I didn’t), you will be clued in by the generous 50G Fairy Godmother achievement you receive just for starting the game. Real karma points! 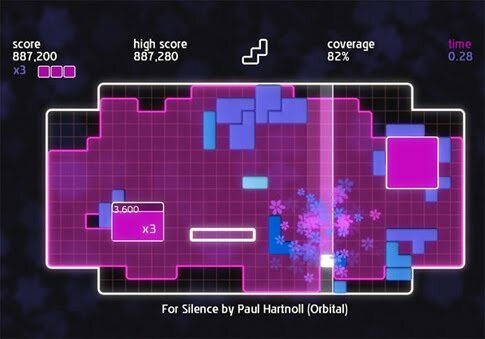 Chime plays a bit like Lumines, a Tetris-like puzzle rhythm game that combines the act of building with an ever-heightening musical accompaniment. Chime is more like Tetris than Lumines, however, with a variety of different geometric shapes falling onto a grid and interlocking much the same as the classic Russian game. Your objective is to create squares or rectangles on the grid while an activation line creeps across your screen in time to the music and clears away blocks with a flourish of butterflies and spiral shapes. And as you build, the music grows from a simple melody or voice into a full symphony of sound as you cover the entire grid. 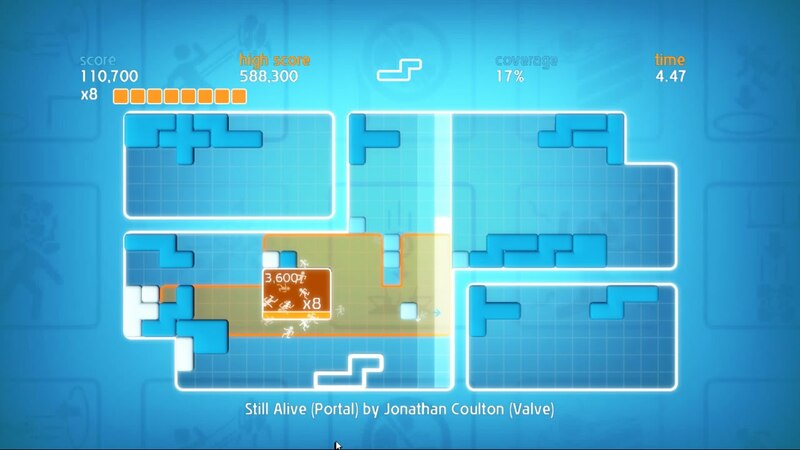 The music crescendos and flows perfectly as you reach the end of the level. Chime’s five different songs all fall under the ambivalent genre of electronica, with a selection by Moby and one by a member of Orbital being my personal favorites. 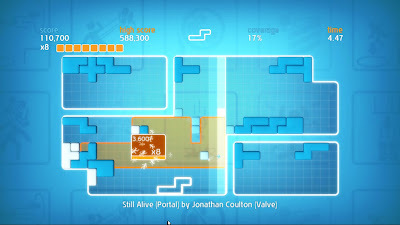 The PC version includes ‘Still Alive’, Jonathan Coulton’s mega-popular credit song from Portal. Instead of the bubble gum chewing, headache-inducing techno pop combinations in Lumines or the uninspired background music in Bejeweled, I now have a puzzle game full of music I would actually listen to. And being an avid Tetris player (I was a master in my youth, touting a Tetris watch and a belt pouch for my GameBoy with the Tetris cartridge tucked away in a side pocket at all times), the combination of puzzle game, score multipliers, competitive ranking and gorgeous ambient electronica carefully built together in what is ultimately a simple experience has captured my undivided attention for an entire week (and counting). Maybe you aren’t the type of person who can listen to the same music over and over again for hours, even if you think it’s brilliant, but when the instinctual, quick reaction puzzle mechanics of Chime drive you to continuously consider your choices from every geometric angle, you will be thrilled that it is happening in a place where such engaging music moves with you, adding layer upon layer to create a sweeping, fully interactive combination of hand movements and aural delight. Zoe Mode recently announced on their website that a new version of the game, Chime Super Deluxe, will be available on the PSN sometime this spring and feature a multiplayer mode and additional songs. So it looks like I wasn't late to the party after all, I was just in time for more. Interesting. The description of the music alone has me dl'ing the trial version right now.